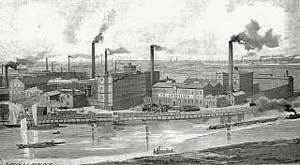 Die Gebauer Höfe sind ein Ensemble von Hallen und Gebäuden einer ehemaligen Textil- und Maschinenfabrik in der typischen Gewerbearchitektur des 19. Jahrhunderts. Das Gelände befindet sich in Berlin-Charlottenburg in der Nähe des Ernst-Reuter-Platzes, auf einem 20.000 qm großen Areal direkt an der Spree. Wir bedanken uns bei Gebauer Höfe für diesen ausgezeichneten Raum und das Ambiente, in dem transitstation stattfinden wird. I first became aware of transitstation in August 2004 when Charles Ryder was in Edinburgh curating an exhibition for the festival. I was immediately intrigued as I was organising a performance-art event for Totalkunst, so I decided to apply for funding from the Scottish Arts Council to finance the trip. I was aware that in factual terms my trip to Berlin was to network, observe practical requirements, names, numbers of people and so on. Happily, during my 16 or so hours at transit station I stopped observing and started experiencing. "Being in the moment" is a clichéd term which goes some way towards describing my experience of transitstation, but that alone doesn't explain why, as I travelled back to Edinburgh, I was aware that a shift of perception had taken place. On my arrival at Gebauer Höfe for transit station day one, the fashion show was in mid promenade, I rushed into the space in U Bahn mode, almost crashed headlong into a gently swaying model, then, without a seat 26, row B or catalogue with customary artspeak intro on the wall with arrows, I picked my way through the scaffold labyrinth to find a suitable vantage point. Like anyone involved in the contemporary arts scene I've been to various happenings that aim to unsettle the viewer from premeditated view point etc., but still, it's easy to take a distanced approach with us wherever we go, a safe insularity. For most visual artists, imaginative states usually occur in solitude, in private, or carried around privately in a public space, so that this waking dream-state remains intimate, until distilled and distanced for a gallery or similar place. The scaffold structure of transit station seems to extravert this dream-state. 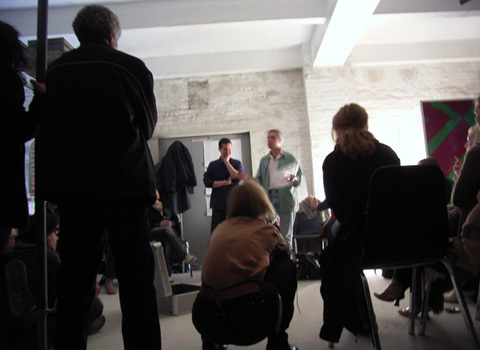 Audience become part of the concept as much as performers, performers and artists are in the process of preparation or act. It is, as Dagmar Glausitzer-Smith describes it, a journey and a process, but it's one in which each moment is intensified and brought more fully alive by proximity to the artists' work and creative process. In simple terms, as viewer you are not guided, you can move around the space freely, changing your vantage point to experience each piece in different ways. Theatre in the round has been with us since the sixties so it's a familiar concept, but transit station extends into new territory because there is no stage space at all. The unpredictable set-up (not to mention bumping into performers, especially after a few beers) is what shifts you out of the sense of a private imaginative response. By day two, as I began talking to the artists, I learned how they had responded to the fluid challenge of transit station, for example separate pieces by musician / composer Rupert Cheek and performance artist Katherine Hymers which were happening at the same time, began to work in tandem, further diversifying interpretation. Art and life merged in Kate Moyse's piece, which explored the nature of collaboration and sharing, the concept expanding with last minute inclusion of other performers. 'NoMansTime Automatics' were in the perfect setting for physical theatre - fully utilising the physical set-up and the concept of transit station with an agitprop piece that explored Pinteresque social dynamics in physical form. Some of the acts directly transferred a pre-structured act into the space, but the set-up subverted the performance, so that musician Ricardo Wende's electric guitar solo somehow resembled a performance artist's interpretation of a musician's electric guitar solo! On my return to Edinburgh, a friend told me about an article written by Max Glaskin for the Sunday Times, which described recent experiments in road traffic control in Holland where traffic lights and signs have been completely removed from a particular street. With the absence of signs and guidance he realised that "a new approach to the situation was needed, so I started to look at the other people making the crossing. Make a move, watch the faces of the nearest drivers..." He describes the experience of driving in a street with no signs as almost like mind-reading, but it certainly made sure that I was paying attention. This parallels the central concept of transit station; the absence of guidance intensifies our response. Glausnitzer-Smith says, "It is my task to stand on solid ground and develop the confidence for the unknown in mind and action". For me, this concept became lived experience as performance artist Katherine Hymers, cocooned in white linen, slowly sensed her way through the complicated maze of people and scaffolding, communicating raw fragility and the desire to fully experience and interact with her surroundings.